Grab your besties and taste something new on your next trip...the world is your oyster, and you can eat plenty of those too. One of the beauties of travel is the different cuisines across the world. Yes, ok, you can grab a Chinese or Indian takeaway on a Sunday night from down the road, or nip to an Italian chain on the high-street, but we can't stress enough that it's not the same! Being in Europe, we've got an array of beautiful food and wine literally on our doorstep, perfect for a weekend trip with the crew, or a longer break if you're in need (we're always in need of more food and wine). So, why not embark on an all-eating all-drinking (responsibly please) adventure for your next holiday, you never know, you might even bring some knowledge and cookery skills back with you. At this stage, I think we've said food and wine enough to convince you all, so take a look at our top destinations for your foodie break. *Please note, further reading of this post may result in tummy grumblings, slight watering of the mouth and possible cravings. Literally a stone's throw away, you can fly, hop on a ferry or catch the Eurostar to French food, wine and cheese mon amie; yes, the cheese deserves to be a separate entity from 'food' in France ok. Start the morning with a French pastry from a traditional patisserie and a healthy glug of a cappuccino or two. Lunch al fresco down a cute little side street, or in a scenic square. We'd opt for some fresh seafood and a cold glass of white vino, Moules Marinieres is an absolute must - no one does it better than the French, and Brittany is particularly renowned for it's seafood. In the evening, at least one of the evenings, tuck into a large creamy Camembert with a healthy chunk of freshly baked French stick and a large glass of red Bordeaux (thank us later). Parts of Normandy are famous for their cheese and dairy, so if that's your thing, you know where to go! While you and your friends are wandering the French countryside, as well as taking some fabulous photos, make sure to partake in a wine tasting tour! 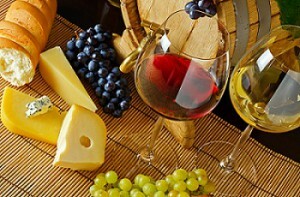 Best regions for this include: Burgundy, Provence, Bordeaux and Champagne. Oh Spain, how we love thee. The British tourists 'took over' the Spanish coastlines decades ago, and even though there may be an abundance of very British 'pubs' and restaurants dotted all over the place, the Spanish cuisine definitely lives on and, in our opinion, is far superior! 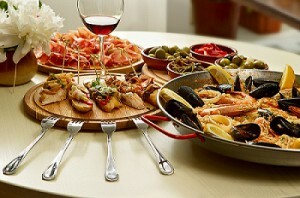 And what is better to dig-into with your mates than a table overflowing with Tapas? Nothing is better. That is the answer. All the cured meats, think authentic chorizo and slices of ham, fresh crisp salads, fried fish, croquettes, tortillas, oh the list is endless and we want it all. The Spanish cuisine is all about sharing, and this is extended to their choice of drink; get the jug of Sangria in and you and your friends are set. Not hit that spot yet? No problem, order some more, however much more you fancy. One of the brilliant things about Spain, is the price; it's nice and cheap, but definitely does not stint on quality as most of the ingredients are all from local produce. Oooh, how could we forget to mention Paella? Make sure to have this at least once, they come in meat, fish and veggie varieties and if it was up to us, we'd try them all! Spain also has some lovely countryside, and of course vineyards, so wine-lovers, visit Catalonia, Sherry and Cava for your fix. So we can't really talk about food and wine in Europe without talking about Italy. Pastas, Pizzas, Risottos, Foccacia, cured meats, olives, cheeses, oh the list of beauties go on for days. 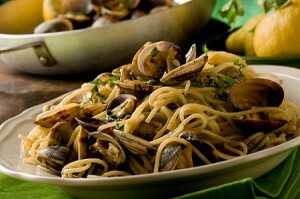 Depending on where you are in Italy, there is also some amazing seafood; Spaghetti alle Vongole is a personal favourite and the best spots for fresh seafood are obviously quite coastal: Naples and Salerno, Bari, Rome and San Marino. Pasta and Pizza are like no other when in Italia, the literal Godfather of these carb-licious delights. Be sure to try Cacio e Pepe and proper Carbonara, as well as a traditional Margarita pizza, these may sound simple, but sometimes they really are the best! In terms of wine in Italy, where to begin? Oh so much beauty in a glass of vino...the best regions for wine tasting are: Piedmont, Lombardy, Veneto and of course, the infamous Tuscany. Well if your belly isn't growling right now, I'm not sure why! Quick, book a last minute weekend away with your squad to one of these gorgeous locations, and grab yourself some last minute travel insurance while you're at it...our single trip policies start under a fiver, so there's no reason to break the bank either - just the chair you're sitting in when you consume all of the food.